If you like wine with attitude, look no further than big, bold, fruit-forward flavors of Unruly. Get a taste of the top-selling brand of wine at BevMo! We carry an extensive portfolio of their most popular varieties, each with its own distinct varietal character. 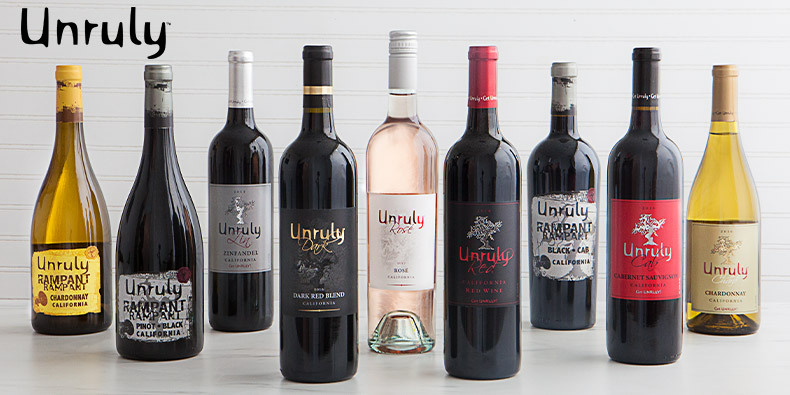 Uncompromising, edgy and adventurous, Unruly is known for producing accessible, crowd-pleasing wines that also appeal to serious connoisseurs—delivering smooth, drinkable flavors with great balance, depth and tannin structure. Drink outside the lines with one of the most award winning, versatile value wines in America. Tasting Notes: Aromas of black peppercorn and blackberry. Earthy taste of spice and black fruit compote with a generous finish. Tasting Notes: Citrus aromas with flavors lemon, honeydew and green apple, followed by hints of toasty oak. Rich and balanced. Tasting Notes: Blackberry, cocoa, caramel and vanilla fragrance. Flavors of fig jam and dark chocolate with balanced acidity. Tasting Notes: Black cherry, blackberry and peppercorn aromas. Dark and dense flavors of clove, spice and currant with bold tannins. Tasting Notes: This buttery chardonnay is medium-bodied, fresh and aromatic. Tastes of ripe pear, butter and honey with aromas of oak. Tasting Notes: Scent of black cherry, plum and cocoa. Sweet, dark fruit entry with elegant mid-palate tannins and a clean finish. Tasting Notes: Fragrance of black cherry, vanilla and jam. Taste of spice and dark fruit featuring smooth tannins and a juicy finish. Tasting Notes: Aromas of raspberry and floral notes. Flavors of strawberry and ripe watermelon with a fresh, balanced structure. Tasting Notes: Wild blackberries and tons of spice on the nose. Black cherries and toasted oak on the medium-bodied palate.